Our mostly Red Devon herd is 100% Grass-Fed. They move to a fresh paddock at least once per day. Our herd is relaxed, the cows used to us. We age our beef for at least two weeks on the rail before cutting. You will notice in our Ground Beef and Bacon Burger the quality of our trimming. We are nose to tail butchers, and we're cutting weekly, so please don't hesitate to put in a request. Otherwise, you can find us year-round with a seasonally appropriate array of cuts. Raised on pasture in chicken tractors on a diet of grass and grain (grown organically, not certified). We raise two different breeds - Freedom Rangers and Cornish Rock. We part out the birds all Summer long for your grilling, roasting, frying, braising pleasure. Our herd of Katahdin sheep are 100% Grass-Fed. They live with Torch, their guardian dog, and move to fresh grass daily during the grazing season. We are very proud of the quality of Lamb that we've achieved since becoming shepherds here. We make great lamb sausages in addition to offering the full gamut of cuts! Our layers are truly free-ranging, raised on pasture. Our eggs will tell you the story themselves - standing up in your skillet, yolks orange as the sunset. They're just a different product than eggs from birds raised indoors. We raise several different heritage breeds here each year to give us the fun, multi-colored eggs that make up our dozens. Our pigs are raised in the forest here, where they can forage, wallow, run around, and generally stay cool and comfortable during the hot summer months. In addition to their forage they eat certified non-gmo grain. 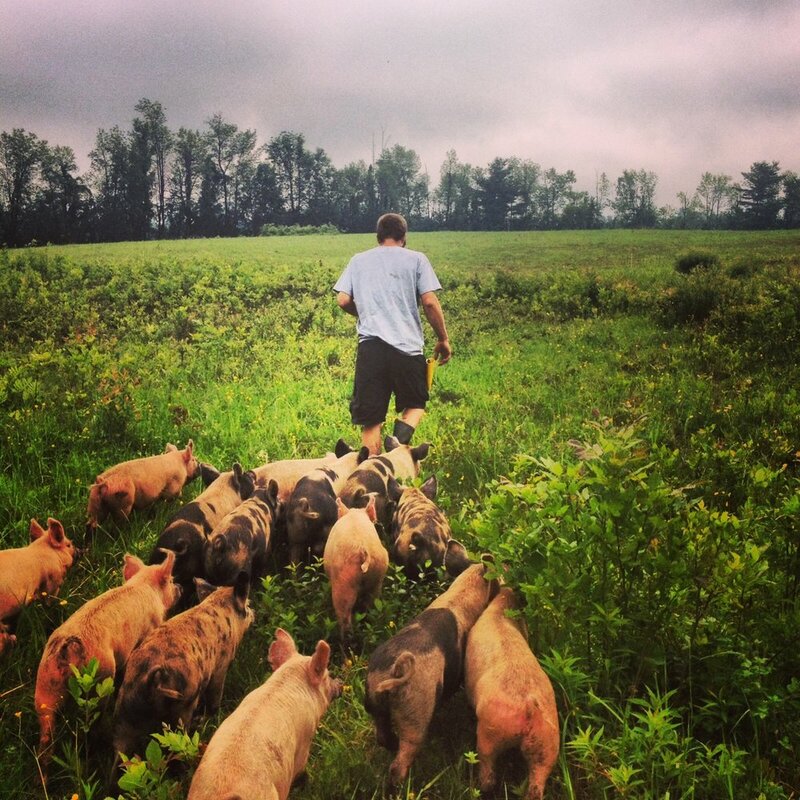 Asa is a pig whisperer, and pays careful attention to our genetic selection here at MCF. We have some beautiful lines of piggy here that thrive in our particular conditions. We make awesome sausages here at MCF, which are great to have on hand for an easy, delicious meal. Our pork cuts, though, on their own, will be an incredible surprise for you if you're used to industrially farmed pork. If you find yourself addicted, check out our custom cut bulk buying option to stock up at a discount! We raise bronze Turkeys, ready for harvest in the Fall. 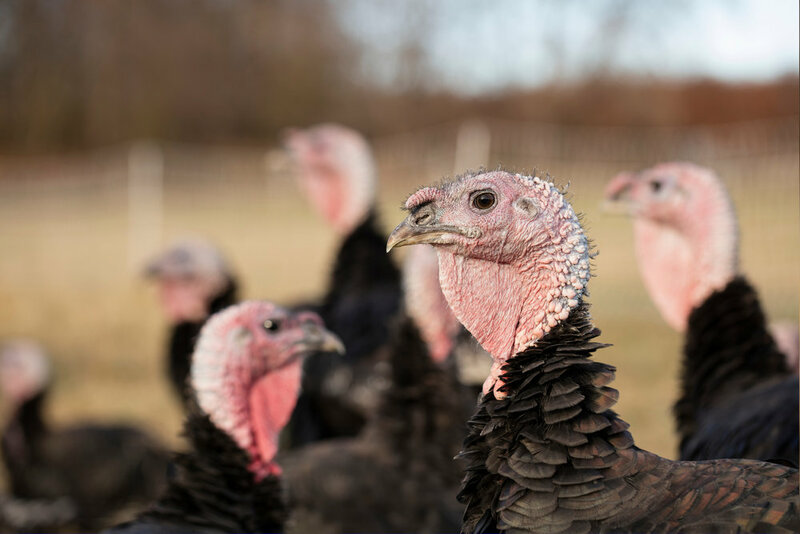 They are richly flavorful from their free-ranging - we've heard many times that "this was the best turkey we've ever had". We take requests year-round, and they are first-come, first-serve. Here's a LINK to the turkey sign-up page.